One of the ways Wikipedia encourages contributions is by creating and giving various Wikipedia Awards. Museum and art consultant and influential Wikipedian Sarah Stierch spearheaded two new awards in the last week. The first for the Women’s History Wikiproject, the Ada Lovelace Award. It is given to editors who make significant contributions to Wikipedia in the area of women and technology. The art for the award is the Ada Initiative’s new portrait of Ada Lovelace, created by artist Colin Adams and CC licensed by the Ada Initiative. 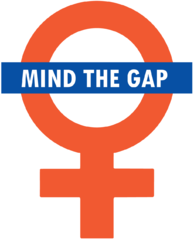 The second award is the Mind the Gap Award, for working to close the gender gap on Wikipedia and related projects through content contributions, outreach, community changes and related actions. If you make either of these awards, please tweet about it and cc the Ada Initiative (@adainitiative), and we’ll retweet. Thanks, Sarah Stierch, for your hard work making these awards happen! Wikipedians, award away! New Wikipedia awards: Ada Lovelace and Mind the Gap by the Ada Initiative is licensed under a Creative Commons Attribution-ShareAlike 4.0 International License. This entry was posted in Ada Initiative resources in use, Getting involved in open tech and culture on October 13, 2011 by valerieadainitiative.